We left Johannesburg on a cold wintery day on the evening of 19th June 2000 full of anticipation and excitement at what awaited us in Italy especially in the eternal city of Rome. On the flight to Rome via London, we were scattered around the aircraft but were united by our faith. We spent some time in transit at London airport then at last we were on our way leaving behind a very wet, rainy England. We were greeted by sunshine on our arrival at Rome Airport then ‘ made our way by luxury bus to the Priory at Albano. For some it was a first pilgrimage and for some it was their very first trip overseas. Pilgrim House Albano stands comfortably in a wooded setting of Roman pine trees, olive groves and vines and gave us a warm welcome from the beginning. As the bus would not enter the narrow gateway, we dragged our luggage up the long driveway and flights of stairs little knowing that this was just a small taste of what was to come the next day when Father Esposito led the “Great Trek” through r the streets of Rome. That evening after our first Holy Mass in the little chapel dedicated to the Sacred Heart we enjoyed the first of many delicious meals – Pasta a la Albano in various forms becoming a firm favourite! From then on each day began with Holy Mass. a very quick breakfast of Italian bread, homemade jam and coffee and then a brisk walk to the railway station to catch the 0825 train to Rome Termini. Depending on the situation of the Churches we were about to visit, we walked from Termini Station or caught an underground connection. The underground was a bit scary even for South Africans as we held onto our valuables tightly for fear of being robbed by gypsy pickpockets. Each day we were supplied with a picnic lunch and while we enjoyed a welcome break we discussed the various churches we had visited that morning then we were off again to fit in as much as possible before returning to Albano just in time for Rosary, supper, a refreshing shower and bed, glorious bed! One cannot put into words the feeling of awe one feels when seeing the magnificent churches and the treasures they contain all created so very long ago by men to the glory of God. Aches, pains and blisters are forgotten as one gazes spellbound at the beauty of it all. What a privilege to be able to venerate the Saints at the very site of their tombs and to pray for ones loved ones in such holy places. A special mention must be made of the leader of our little flock, Father Esposito, whose knowledge of Holy Rome surpassed our expectations and overwhelmed us to such an extent that we even forgave him for giving us such sore feet. Holy Steps. We also made an afternoon visit, to the Coliseum. The Archbasilica of the Most Holy Redeemer, more commonly known as St. John Lateran. It is the most important of all the churches in Rome and in the world. On the first weekend our legs were given a welcome break when we traveled by coach to Montecassino Monastery built by St. Benedict and destroyed by the Allies during the 2nd World War. We marveled at the fact that the complete monastery had been rebuilt from the ashes. After lunch we continued by bus to Priverno Fossanova where St. Thomas Aquinas died. This Church was beautiful in its simplicity. On Sunday morning we celebrated the Feast of Corpus Christi by attending Holy Mass in the Albano Chapel and joining the Corpus Christi procession through the grounds of the Priory. The sisters had decorated the route with flowers and leaves and prepared a beautiful altar for the Blessed Sacrament. That afternoon we travailed to the shrine of Maria Goretti at the seaside town of Nettuno and also visited her home where she was martyred at Le Derriere. Monday we were back on the march again to Rome visiting St. Paul’s Outside the Walls, one of the Patriarchal Basilicas. In the afternoon of the same day we visited the Basilica of St. John Lateran. Surprisingly, enough, we were all quite fleet of foot by the time we boarded the bus for Montalenghe the next day en route to Ecône to attend the Ordinations. baking hot days in Rome, we shivered at the top of the pass where the St. Bernard Monastery is situated. One of the highlights of the Pilgrimage was still to come – the Ordination Ceremony of seven young priests and nine deacons. What an experience! Then the next day the first High Mass of one of the newly ordained priests served by two newly ordained deacons. We thanked Gad for the privilege of being able to participate in person and receive so many graces and blessings. We returned to Montalenghe through the St. Bernard Tunnel. The interior of the new church at Ecône. The next day we visited Turin, home of the three saints of Charity. Joseph Cafasso, who consoled prisoners, especially those condemned to death Joseph Cottelengo, who started the little House of Divine Providence helping the poor especially the retarded and deformed and St. John Bosco, founder of the Salesian Order. We also visited the Cathedral of Turin where the Holy Shroud will be on view in August 2000. An unexpected surprise. by courtesy of our bus driver, Fabio: our route back from Montalenghe to Albano would be made via Assisi. This necessitated Holy Mass at 6 a.m. and an early departure. We enjoyed a very pleasant drive on the freeway – the countryside changing considerably as we neared Assisi. Medieval style architecture was most prominent and extremely picturesque but oh the heat! 31 degrees – we gave thanks for an air conditioned coach. Once again we were on the march and uphill too. We offered up our discomfort and hoped that St. Francis and St. Claire were looking down on us. We saw the beautiful Frescoes in the Upper Basilica soft earthy glowing colours and rich in their simplicity. Then the Basilica of Santa Maria degli Angeli which houses the most precious treasure of Franciscan spirituality, the Cappella Della Porziuncola – the little Chapel of St Francis. and finding the Church of St. Claire closed. A long, long day. Our deviation meant that we arrived back in Albano at 8 pm. Albano now felt like home to all of us as we enjoyed a good supper, a refreshing shower and off to bed. We began our last week with a day trip combining Subiaco (St. Benedict and St. Scholastica) and Genazzano (Our Lady of Good Counsel). What a feast of artistic beauty awaited us at St. Benedict’s monastery. Beautiful Frescoes in natural soft colours depicted many incidents of the saint’s monastic life. One cannot believe the heights he climbed – in those days Men were Men? We had a pleasant lunch in the shade of the trees lining the entrance driveway before continuing our journey to Genazzano. 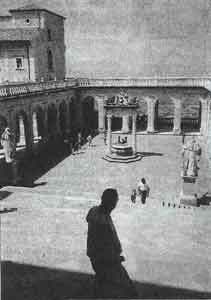 The cloister in front of the Abbatialchurch at Monte Cassino, in which the pilgrims prayed before the tombs of Sts. Benedict and Scholastica. 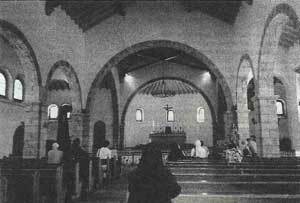 Genazzano Santuario, Augustinian Shrine of Our Lady of Good Counsel where an image of the Blessed Virgin appeared miraculously on the church wall. We said our Rosary in front of the exquisite golden altar housing Our Lady’s image and returned to Albano in the late afternoon. Our final day. By now we were very familiar with the train journey from Albano to Rome. We enjoyed our last day visiting the churches in the historical centre of Rome. St. Andrea delle Frate, Our Lady of the Miracle where the Jew Ratisbonne was miraculously converted. St. Maria in Via. where Our Lady’s face appeared in the well, St. Sylvester, where we prayed in front of the head of John the Baptist and lastly the Church of the Twelve Apostles. Father allowed us to visit the Trevi Fountain and throw our coins in to “ensure” a return trip to Rome one day. We caught an earlier train back to Albano and prepared for our departure the next day. Father Esposito said Holy Mass for our intentions and in thanksgiving for the graces received on the Pilgrimage. We boarded the coach en route to Rome Airport and bade farewell to Italy.